If you troll for trout and salmon, and haven’t tried the Slide Diver or the Lite Bite Slide Diver you should. 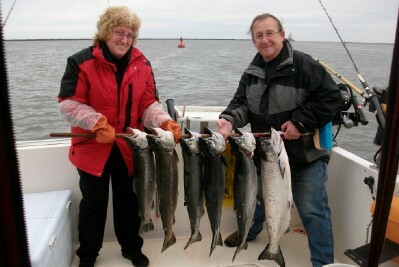 It is a real fish catcher onboard my charter fishing boat, the Fish Doctor, and has really been smokin’ during the fantastic April-May king salmon fishing we’ve been enjoying in the Oswego area of LakeOntario this spring. Anglers who troll for trout and salmon are familiar with directional diving planers like the Dipsy Diver. These planers attach directly to monofilament, braided, or wire line and take your bait or lure down to target depths. The adjustable rudder on many of these diving planers directs them to port or starboard of the boat. These types of planers use water pressure against the angled surface of the diver to take the diver and the attached leader and lure to depth. A drawback to standard diving planers…, the length of the leader training them is limited to a maximum of about eight feet or whatever length an angler can handle when the planer is reeled to the rod tip while landing a fish. This is where the Slide Diver parts company with all other available directional and nondirectional diving planers. Slide Divers differ from all other diving planers and are a major part of my trout and salmon arsenal aboard the Fish Doctor for one reason. They are inline planers, that is the line passes through them and can be locked in place any distance ahead of the lure. This allows a lure to be fished at any distance behind the Slide Diver, a huge advantage when trolling for boat shy trout or salmon just below the surface. In many cases, a trout or salmon in the top 30 feet or less of water won’t hit a lure fished on a 6’to 8’ leader behind a diving planer. Set that lure back 20’ or more and lock your line in place in a Slide Diver, though, and you’ll catch fish. The Lite Bite Slide Diver is an improved version of the Slide Diver that has a different trigger mechanism, allowing even the smallest trout or salmon to release the trigger, avoiding dragging small fish behind the planer undetected. The setup I’ve used this spring on Lake Ontario to fish Lite Bite Slide Divers is a 9’ medium heavy rod with standard guides, and an ABU Garcia 7000 Synchro line counter reel spooled with 40” test Berkley braided line. The braided line is slipped through an 8 mm. bead and attached to 6’ of 15# to 20# test fluorocarbon leader with a barrel swivel. The rudder on the Slide Diver is adjusted to the #3 setting taking the diver as far away from the boat as possible. Spoons are normally fished 20 to 40 feet behind the Slide Diver. When any size fish hits the spoon, the trigger on the diver releases and the diver slides back to the bead ahead of the swivel, 6’ ahead of the spoon. You will appreciate one of the greatest advantages of the Slide Diver when a steelhead or landlocked salmon hits and goes aerial, leaping across the surface. Instead of dragging a solidly attached diving planer along with it, increasing the chance for the hook to pull free, the inline Slide Diver slides freely on the line, never allowing the fish to pull directly against the diver. 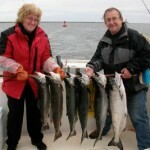 Chris Dwy and Bill Purcell will attest to the effectiveness of Slide Divers after fishing them aboard the Fish Doctor onMay 7, 2012, to boat a limit of king salmon and brown trout. With the last king of their limit thrashing in the net, three more kings hit. Chris and Bill had a triple on, two on Slide Divers. All three kings were released unharmed to thrill another angler another day. There is a bit of a learning curve involved with using Slide Divers, but they are so effective for trout and salmon, the time it takes to learn to use them is well worth it.